The new line of LEGO Avengers Infinity War sets has Marvel fans going crazy. One of the most highly anticipated of these is the Thanos: Ultimate Battle set. The newest cinematic installation in the Marvel Universe is Avengers: Infinity Wars. This film is set to be one of the most popular of the year, if not the whole decade. At the center of Infinity Wars lies the feared and powerful villain Thanos. The Mad Titan is possibly the top attraction of all of the new LEGO releases, making this set a must-have for serious Marvel fans. The Thanos: Ultimate Battle set sports 3 mini figures, Iron Man, Star-Lord, and Gamora, along with the amazing Thanos big figure. Iron Man is featured in his new electromechanical armor suit with attachable wings. Lifting his helmet reveals Tony Stark’s with the virtual heads-up display projected across his face. Gamora is included with a brand-new updated design, with a brown trench coat over a black leather outfit and added facial details. The Star-Lord figure is the same as in the Ayesha’s Revenge set, with his red coat over a grey shirt. All three mini figures have detailed reversible faces that display different emotions for a variety of exciting experiences. The Guardians of the Galaxy ship, known as the Benatar Spaceship is an update from the Milano Spaceship seen in previous sets. The Benatar has a cockpit that opens to fit the included space scooter along with 2 mini figures. The bright orange, beautifully designed Benatar has rear storage space, a removable roof, adjustable wings, 2 stud shooters, and a connection for an escape pod. The mini scooter has 2 seats and attachment points for Star-Lord’s two guns and Gamora’a sword. The real reason to buy this set, and what makes it possibly the most desirable out of all the new LEGO Avengers: Infinity War sets is the amazingly crafted Thanos big figure with the Infinity Gauntlet. Thanos is depicted here with a vivid lavender skin that beautifully contrasts his dark blue suit and complements his golden headpiece. Many who missed out on the Thanos figure from Avenjet Rescue Mission set from 2016 are excited to get this latest version. Thanos comes with a large sword and his powerful Infinity Gauntlet. The gauntlet is only included in this set, making it absolutely necessary for LEGO Marvel fans. Thanos can attach the Infinity Gauntlet by removing one of his hands to become a truly intimidating and formidable foe! Each of the Infinity Wars sets comes with one of the 6 Infinity Stones that attaches securely to the gauntlet, so to complete the piece, you will need to collect them all! The Thanos: Ultimate Battle set includes the red Reality Stone from Thor 2: Dark World. With this new LEGO release, fans can recreate the epic battles seen in the Infinity Wars movie, or create their own storylines in the Marvel Universe. The best features of this set are the beautiful new Benatar Spaceship, the Thanos big figure, and of course, the Infinity Gauntlet. An updated Star-Lord figure or a slightly beefier mini figure lineup would have been great, but overall this set is highly recommended. Fans will want to collect all of the new sets and deck out the Infinity Gauntlet with all 6 stones to unlock Thanos’ true power. The Thanos: Ultimate Battle box is an amazing place to start your collection. 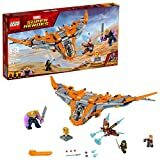 The LEGO Marvel Super Heroes Avengers Infinity War Thanos: Ultimate Battle 76107 set is available on Amazon. Check out the product details and customer reviews for more info!